Santa Clause is coming! 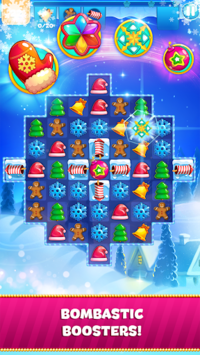 Play this fun Christmas game with 1500+ match 3 levels! Christmas is coming again! 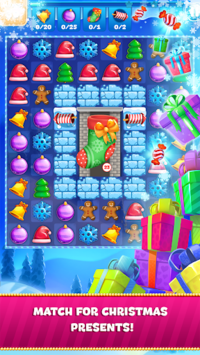 Play this Christmas game with 1500+ levels of match 3 fun, filled with lots of new challenges! Light the candles, clear the snow to find the gifts, catch the jumping snowmen, fill the gift bags. Drop Santa down the chimney, ignite the firecrackers, fill the big sock and look what's in the fridge. All while taking care of the snow guns! There are no lives to lose, and you don't have to annoy your friends to progress. Play as long as you want! 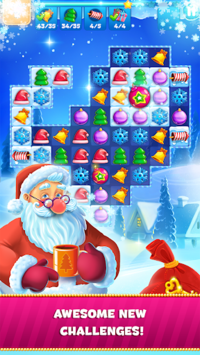 This game will fill the long winter evenings with lots of pleasure!